Lori is a former middle school teacher with extensive experience leading groups of all kinds. She is passionate about wilderness travel and taking the opportunity to refresh your spirit through time outdoors. Her greatest pleasure is to help others find joy in the richness of a wilderness experience. Lori has lead groups from middle school through adults on a variety of canoeing and backpacking experiences. She is certified in Wilderness First Aid. LuAnn is a personal coach and certified facilitator of the Passion Test. Her passion is to help others find their passions and live a life of joy & fulfillment. Using her talents as an event planner, she creates inspiring events that help women to find themselves and have the courage to live their dreams. 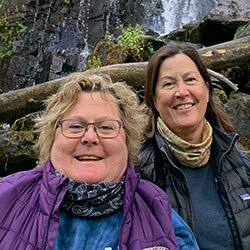 Lori and LuAnn have developed their guide business "Transformational Treks" based on their mutual desire to take women on wilderness trips for personal growth and renewal of spirit. Lori and LuAnn discovered their love for wilderness as children when their father ventured with them into the BWCA for extended wilderness adventures. They were hooked into the beauty and splendor of this unique landscape. Here they learned the joy of paddling into new lakes, discovering unique campsites, and simple meals cooked over a fire. They relished the physical challenges of portages, long paddles and handling whatever weather nature dished out that year. As young girls they found the peace, strength and inspiration provide by those lakes and trees. Now they provide the opportunity for these amazing adventures to women across the country. Join Lori and LuAnn as they share tips and tricks for a group of women to successfully tackle the wilderness together. Get pointers about transporting canoes, portaging gear, staying safe, and choosing quality food. Discover what clothing works best to be dry, warm, and comfortable. Learn how to build a team that trusts and empowers each other to grow while creating a unique experience with lasting bonds.